Now that Italian design fashionista ZegnaSport is getting into the solar charging jacket game, it proves you don't have to resort to a nerdtastic ScottEVest solar charger coat to keep your cellphone going on sunny days. 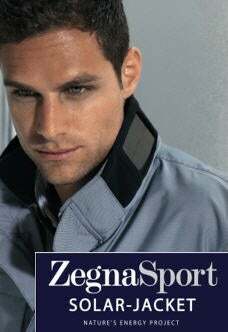 We like the subtlety of this Zegna Sport Solar JKT with its solar panel that's smoothly incorporated into its collar. All the electrical juice is conducted through special textile cables, and you can plug your cellphone or MP3 player directly into the jacket, or it can charge up an onboard battery in eight hours that you can use to replenish power to your devices, too. There's no way of knowing if this self-assured model dude is actually a geek or not, but with this chic cloak, he'll probably have an easy time laying all our girlfriends. But he'll have to wait until next summer for that, 'cause it's going to take those sporty Italian clothiers that long to de-geekify this jacket.